This is the first time I've participated at Poet's United which is a community for poets who blog and which I have only just found. Their Thursday Think Tank #76 is The Soul's Whisper which brought to mind this poem which I wrote back in October. Poet's United can be found at http://poetryblogroll.blogspot.com. I took the photograph of Chagall's stained glass windows at a church near Tonbridge when I visited with my lovely friend Janet. It's a tiny church with the most beautiful light and atmosphere. Lovely, meaningful words, which appealed to me very much. Your poetry is so beautiful and profound, Pen, and the picture suits it perfectly. This is truly lovely. Such a gentle knowing and yes, I agree it's only when you have walked through the pain of loss of love (in whatever way it's lost) only then comes the acceptance and with that the inner spiritual growth. Thanks for visiting me and the lovely comment so pleased to meet you. I have found it to be so. Thank you. This is so beautiful! I love it. You certainly have a knack for writing poetry. love the insights, well done. Wow, Penny, this is beautiful. The windows in your photo are gorgeous - I don't know that church, where is it? I enjoyed your take on the prompt. The poem is strong and rewarding. Penny, you have such a talent with writing! Thank you for the lovely comments you leave on my blog. Am pleased you are enjoying my CQ journey. This is amazingly beautiful Penny.....and the photo is stunning...so glad to have you at here at Poets United!! Oooooh, Chagall - one of my favorites! Your poem, as always, is wonderful. So glad you have this blog to share, Pen! your combination of words and picture are always a delight! 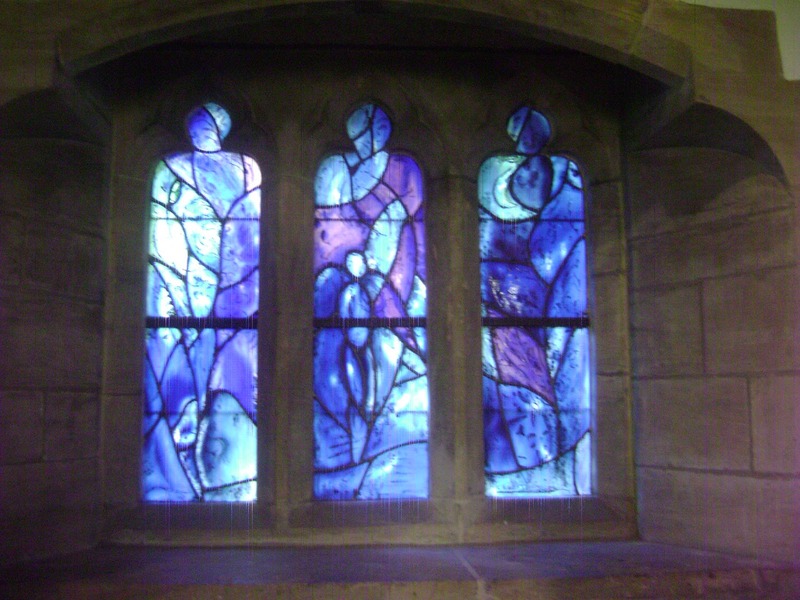 I have not seen this work by Chagall before, and these windows are a treat to see. Thanks. Your poem is perfect with the photo. They both open the soul. Hi, Penny :) Looks very beautiful. I like colors of harmony. what a lovely poem i'm so glad you shared it with us. This is a lovely poem and photo, Penny, and your altered printer's tray is really beautiful! Thanks for all your visits - such a faithful friend! Wonderful poem and your photo is just beautiful. are a lovely complement ... .
Christmas. You've been missed ! Wanted to send along some wishes for a very Merry Christmas and a Happy Healthy New Year! Hope you're OK - we miss you and your fabulous work, Pen. P.S. I have awarded you the Liebster Blog Award. If you are interested just link back to my blog.